Our Sauvignon Blanc reveals as a layered multi-media painting. Crunchy nectarine, litchi, pomegranate and greengage rest juxtaposed to the fundamentals of dusty nettle, pine nut and asparagus flavours all expressed on a canvass of flinty petrichor and elegant acids. Melds beautifully with an intimate friend, goats cheese pastry, Tiger prawns, some candlelight and an Ed Sheeran ballad. After a lower than normal rainfall in 2016 winter and a relative cool summer ripening in 2017, we had a very healthy crop of grapes for the 2017 harvest. The Sauvignon blanc expressed its phenolic ripeness a little bit later than we expected, resulting in a slower ripening period with longer hang time on the vines. This resulted in full bodied wines with complex fruit layers. 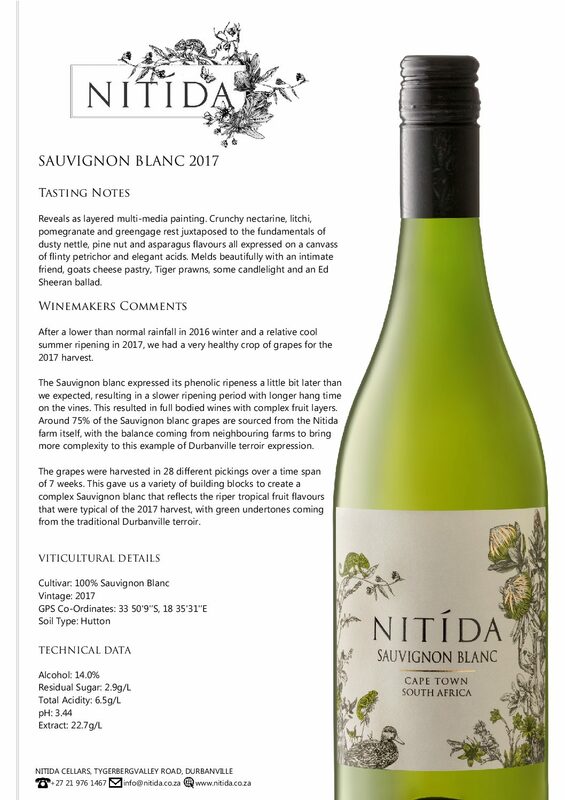 Around 75% of the Sauvignon blanc grapes are sourced from the Nitida farm itself, with the balance coming from neighbouring farms to bring more complexity to this example of Durbanville terroir expression. The grapes were harvested in 28 different pickings over a time span of 7 weeks. This gave us a variety of building blocks to create a complex Sauvignon blanc that reflects the riper tropical fruit flavours that were typical of the 2017 harvest, with green undertones coming from the traditional Durbanville terroir. Stay up to date with news, special offers and events happening at Nitida.